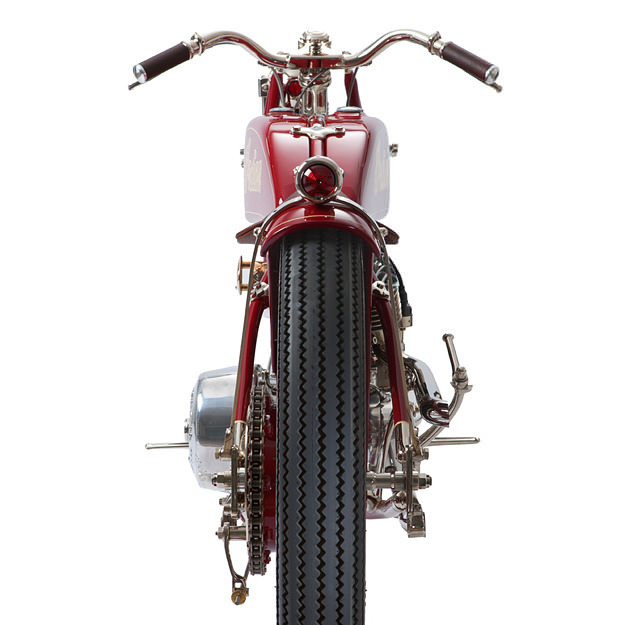 Every year, the Quail Motorcycle Gathering attracts enthusiasts and well-heeled collectors from all over the world to Carmel, California. The quality of machinery is one drawcard; another is the chance to rub shoulders with the likes of Mert Lawwill and Wayne Rainey. Of course, there’s also a competition—and the most interesting class for us is “Custom/Modified”. 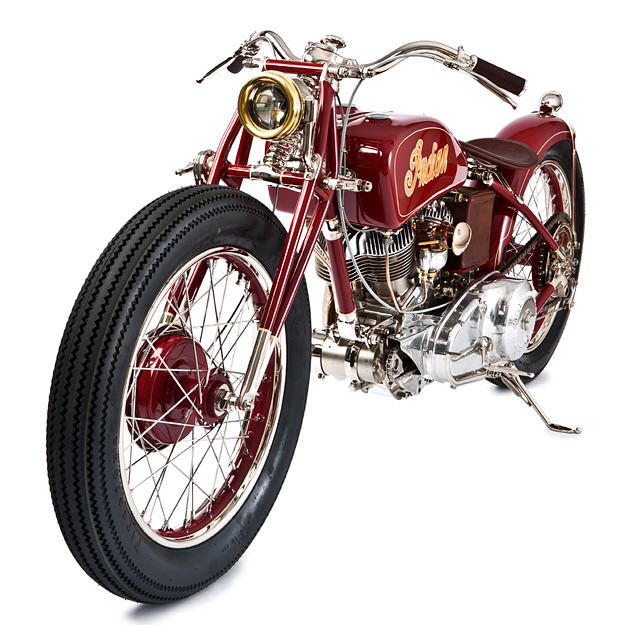 This year, second place went to this beautifully-crafted Indian motorcycle, a 741 Scout built by Jesse Bassett and his sidekick Tim Fiorucci of The GasBox, Ohio. Bassett decided to knock fifteen years off his 1941 Scout, and give it a flavor of Indians from the 1920s. So he raised the top frame rail to sit flush with new hand-formed aluminum split fuel tanks. He then stretched the frame itself four inches, moving the downtube in front of the generator to clean up the lines of the bike. The stance was improved by modifying the girder forks and front axle position, which allowed Bassett to fit 19” Dunlop rims front and rear. The top of the girder was narrowed two inches to reduce visual bulk still further and the bars are modified Harley panhead items. The front hub is original Indian, and the rear is from a Triumph. 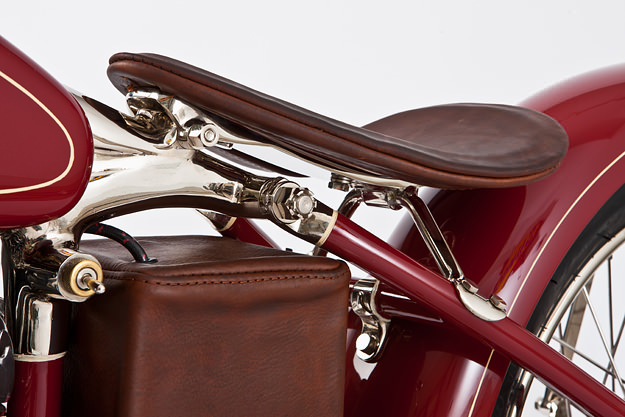 The headlamp is a 1920s automotive lamp and Bassett hand-spun the bezel from brass to replace the damaged original. 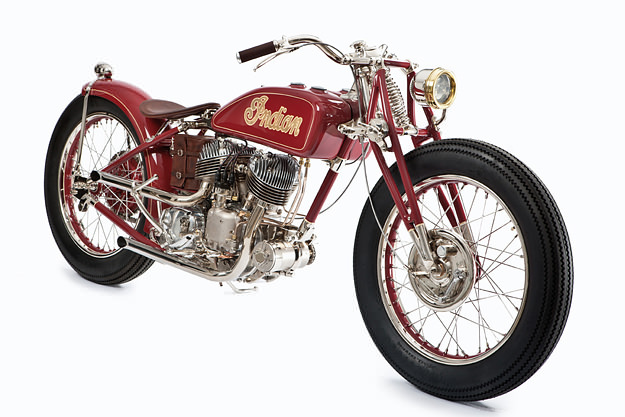 The original Indian engine was kept, but completely rebuilt and mated to a Norton Commando four-speed transmission, giving the rider one more gear than the original. To accommodate the Norton diaphragm clutch, Bassett made new engine plates; the primary was cut in half, offset, and mated with a 1920s Indian outer primary. Finally, all of the aluminum was polished, and the entire frame and fork were nickel plated before being painted in a traditional Indian red. The machine wowed the judges — which included Paul “The Vintagent” d’Orleans — and earned Jesse and Tim a much-deserved trophy. 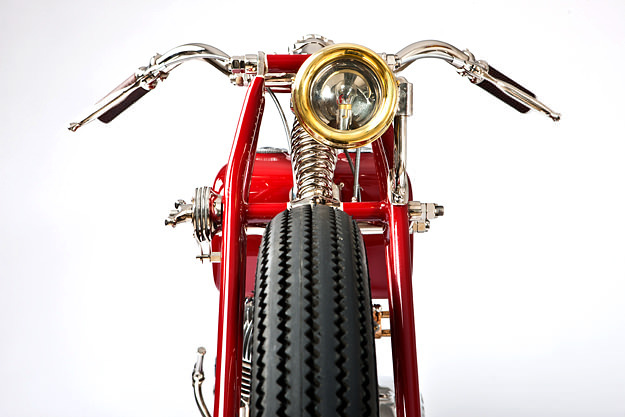 Head over to The GasBox website for more images and details of their other builds, including a beautiful 1949 Panhead.